Every Dropzone is set up under a single SendSafely account, who is designated as the Dropzone Owner. Most companies opt to use a team alias, like secureupload@company.com, as the owner account and then add individual named users as Dropzone recipients. Previously, the ability to make configuration updates, and add and remove recipients was limited to the owner account login. In order to manage a Dropzone as an enterprise administrator, navigate to the Enterprise Console (linked under the Account menu) and locate the Dropzone owner in the Active Users list. Use the Search option in the top right corner if you can't easily locate the user in the list. Once you are on the user's profile page, select the Dropzone option under the Settings menu on the left side of the screen. To remove recipients, click the X next to the user's name from the recipient list. 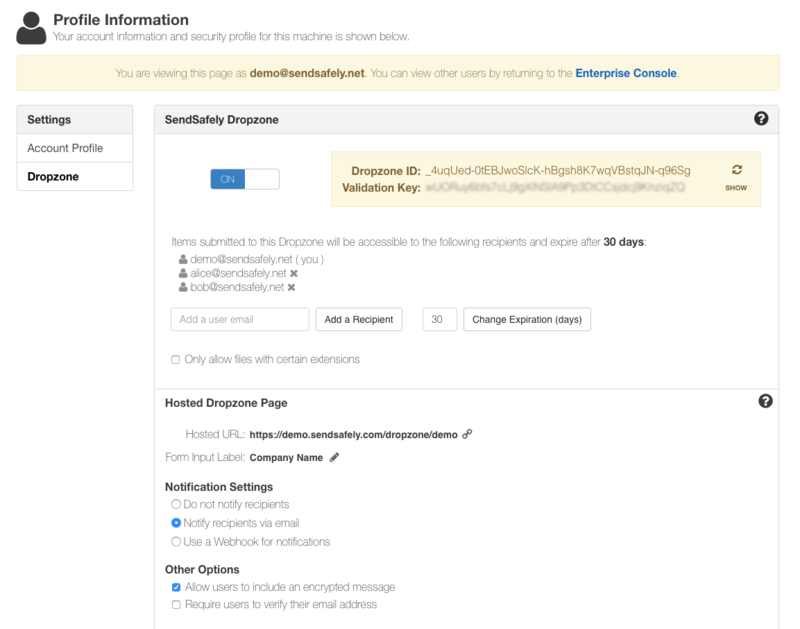 Note that removing a Dropzone recipient does not remove or inactivate the user from the SendSafely portal, just that specific Dropzone. Edits to the Dropzone Form Input Label, Notification Settings and Other Options can also be made from this page.